pennine: Shocking but unsurprising to me. If true then serious questions need to be asked? In fact if true, especially in view of the Manchester attack,some heads need to roll!!! 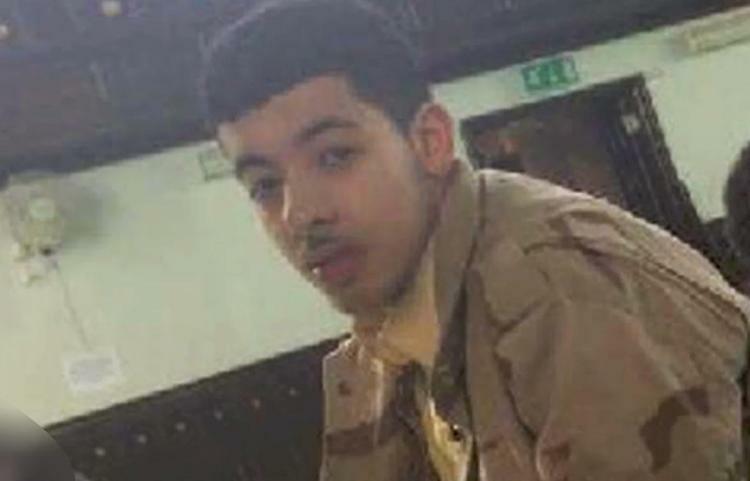 May 24, 2017 (Tony Cartalucci – LD) – As suspected and as was the case in virtually all recent terror attacks carried out in Europe – including both in France and Belgium – the suspect involved in the recent Manchester blast which killed 22 and injured scores more was previously known to British security and intelligence agencies. Thus, astoundingly, according to the Telegraph, a thriving community of listed terrorists exists knowingly in the midst of the British public, without any intervention by the UK government, security, or intelligence agencies – with members regularly travelling abroad and participating in armed conflict and terrorist activities before apparently returning home – not only without being incarcerated, but apparently also without even being closely monitored. LIFG also appears on the US State Department’s list of Foreign Terrorist Organizations. Astoundingly, it appears under a section titled, “Delisted Foreign Terrorist Organizations,” and indicates that it was removed as recently as 2015. 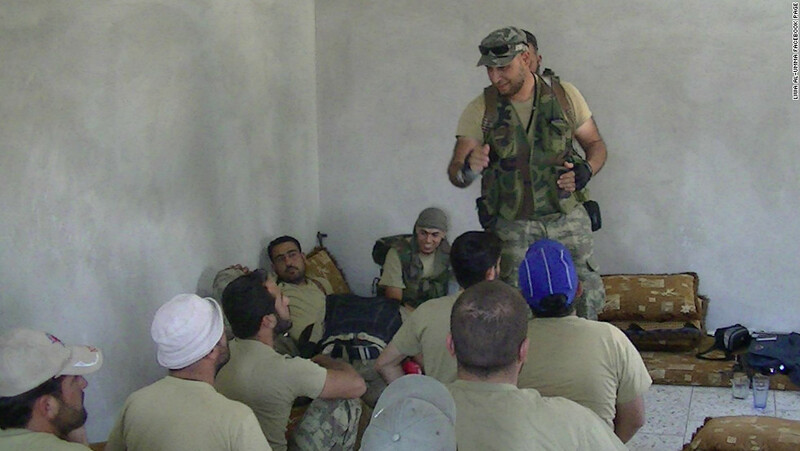 In early 2011, in the wake of the Libyan revolution and the fall of Qadhafi, LIFG members created the LIFG successor group, the Libyan Islamic Movement for Change (LIMC), and became one of many rebel groups united under the umbrella of the opposition leadership known as the Transitional National Council. Former LIFG emir and LIMC leader Abdel Hakim Bil-Hajj was appointed the Libyan Transitional Council’s Tripoli military commander during the Libyan uprisings and has denied any link between his group and AQ. Indeed, a literal senior Al Qaeda-affiliate leader would head the regime put into power by US-led military operations – which included British forces. Not only this, but prominent US politicians would even travel to Libya to personally offer support to Bil-Hajj (also spelled Belhaj). 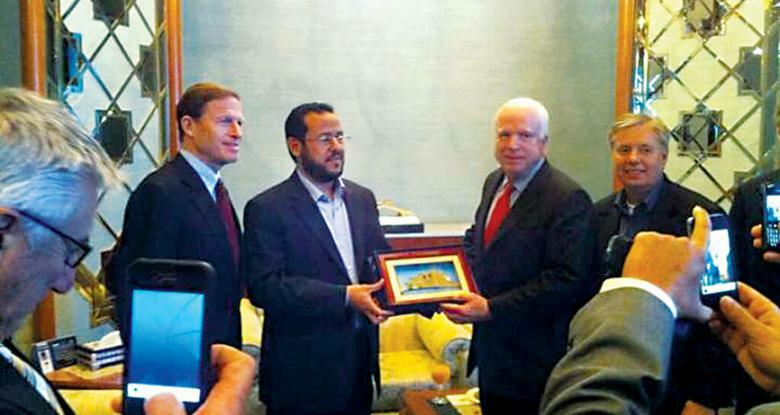 In one notorious image, US Senator John McCain is seen shaking hands with and offering a gift to the terrorist leader in the wake of the Libyan government’s collapse. However – for British security and intelligence agencies – it is unlikely that such an obvious security threat was merely “overlooked.” That extremists thrive within British communities without government intervention indicates complicity, not incompetence. LIFG members would not only assist the US and British governments in the 2011 overthrow of the Libyan government, they would also move on – with Western arms and cash – to NATO-member Turkey where they staged an invasion of northern Syria. Mr Belhaj also discussed sending Libyan fighters to train troops, the source said. Having ousted one dictator, triumphant young men, still filled with revolutionary fervour, are keen to topple the next. The commanders of armed gangs still roaming Tripoli’s streets said yesterday that “hundreds” of fighters wanted to wage war against the Assad regime. Revealed once again is a convenient intersection of terrorist and US-British interests – this time in pursuit of regime change in Syria in the wake of successful US-UK backed regime change in Libya. Al Harati’s army of Libyan terrorists would expand to hundreds, possibly thousands of fighters and later merge with other Syrian militant groups including Al Qaeda’s Syrian franchise – Jabhat Al Nusra. In Libya, LIFG fighters have divided themselves among various warring factions, including Al Qaeda and Islamic State affiliates. It is terrorism that follows as a direct result of British foreign and domestic policy – supporting terrorists abroad and deliberately refusing to dismantle their networks at home – all as they feed fighters and resources into the US-UK proxy war still raging in Syria.